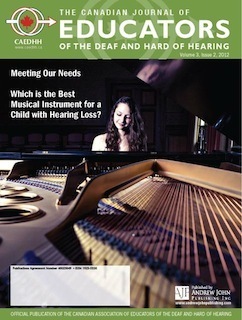 The Canadian Journal of Educators of the Deaf and Hard of Hearing (CJEDHH) is the official publication of the Canadian Association of Educators of the Deaf and Hard of Hearing (CAEDHH). CAEDHH is a national, professional organization of individuals dedicated to the educational development of individuals who are deaf and hard of hearing in Canada. Full, associate or student membership is open to those actively involved in the education of deaf and hard of hearing individuals, or those enrolled in teacher training programs leading to qualification as educators of the deaf and hard of hearing.